Some people have great intuitions, Chiara Ferragni had it before anyone else. The Italian fashion blogger from Cremona (a small city very close to Milan) is only 28 years old, and Forbes has recently put her in the ambitious list of the “Top Millionaires Under-30”: in less than 10 years, Chiara has built a 6 million dollars company called The Blonde Salad, which started in 2007 as a simple fashion blog with pictures taken by her former boyfriend while she was strolling around Milan in her in fancy outfits. Right now, Chiara Ferragni owns a shoe line, she recently published a book, she collaborates with several brands as a “fashion influencer and icon”, particularly with Fendi, Louis Vuitton and Calvin Klein. Also, she has a contract with a model agency based in LA, where she now lives with her American boyfriend, the talented photographer Andrew Arthur and she has just finished to help a group of Harvard students who created a case study on the “Blonde Salad” phenomenon. She really has it all. Some people criticize Chiara Ferragni’s life because it might seem superficial and without a real goal. I recently saw an interview of her and I had a complete different impression about her career and her aspirations: her job is a real business, she is a really humble person but of course her “personal recipe to survive” includes a spoon of self-confidence that it is necessary in certain environments. To me, Chiara Ferragni represents the importance of intuitions in business and in fame: she was able to anticipate a movement and the trend of fashion bloggers. 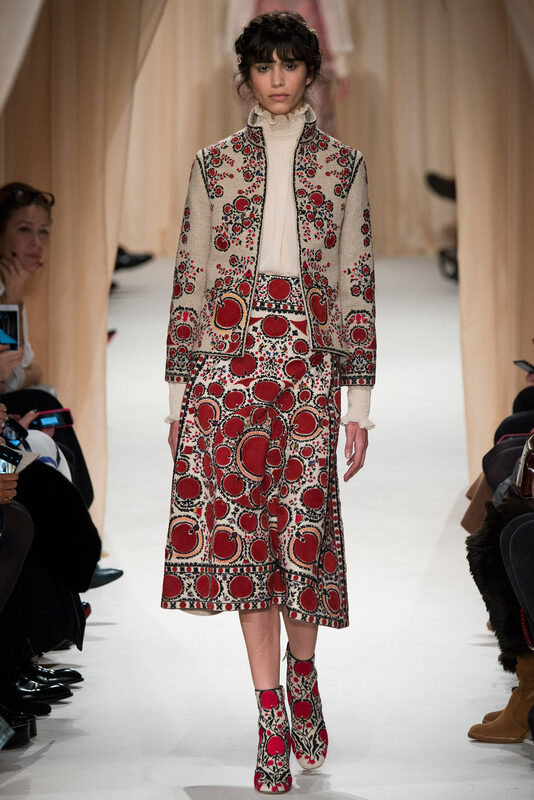 Maria Grazia Chiuri and Pierpaolo Piccioli vision of Haute Couture is East Slavic, mainly Russian and Belarusian! 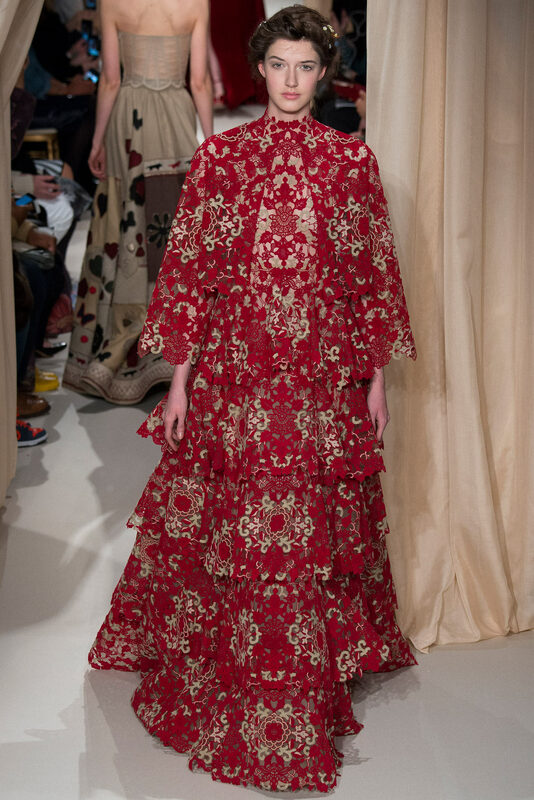 How interesting that in the midst of sanctions against Russia, Valentino’s designers found an inspiration in traditional Russian-Belarus folklore costumes. The idea of a simple Belarusian peasant dress is transformed into luxury but sill effortless ensemble, needlepoint embroidered linen jackets and skirts, flowers appliquéd. 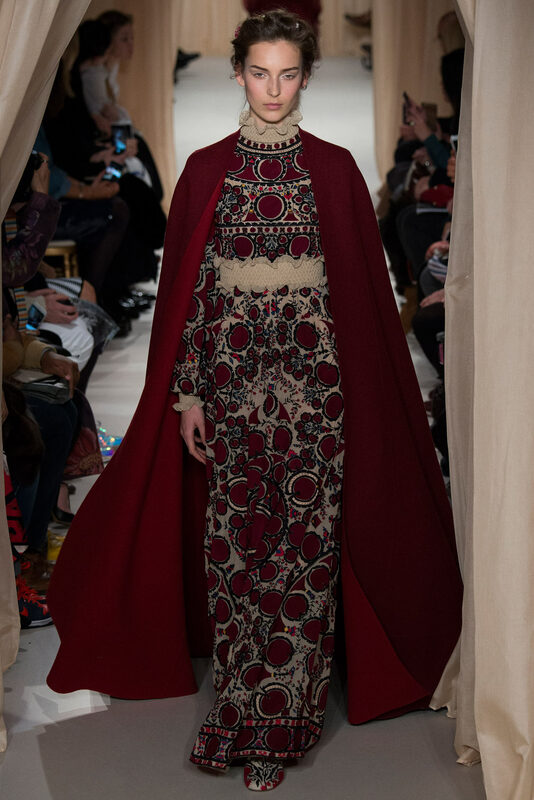 Designers have revived the Russian tsarevna luxury gown, conserving traditional colours of scarlet and burgundy. What a great way for the brand to be inspired by the rich East Slavic cultures and more than that to be in love with them creations. Well brava, we love you too Maria! From ever-growing Russian, Belarusian customer base. At the first sight of sun after a long rainy weekend, fashion enthusiasts take advantage of the opportunity to show off their latest designer shades. 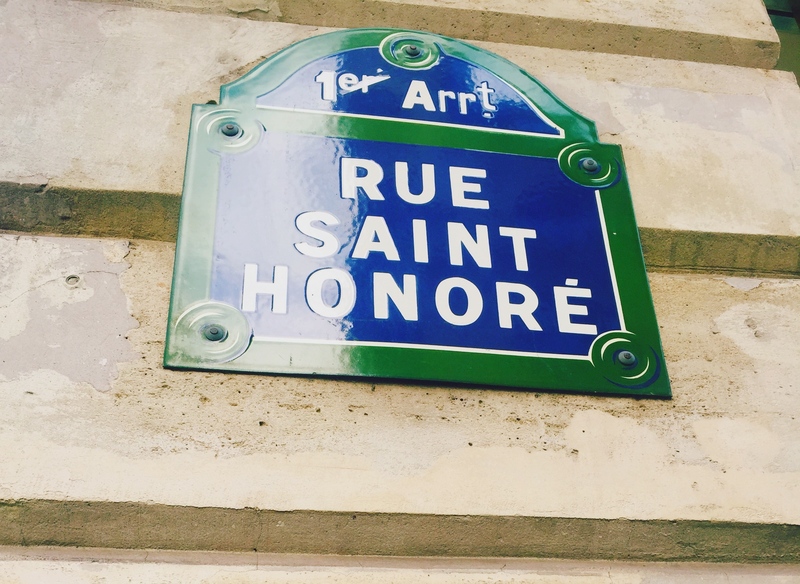 Take a stroll down rue Saint-Honoré in Paris and the array of urban styles is impeccable. On this day clean-styled jackets, hats, and sunglasses seemed to be a reoccuring commodity. Once you can come to terms with the piercing Scandanavian cold, Copenhagen is an understated gem, just as fashionably relevant as Paris, if not more. 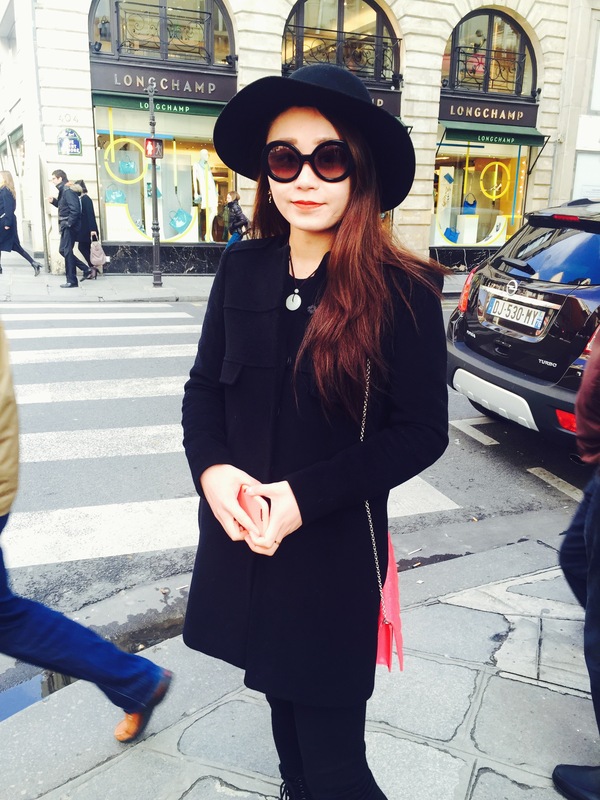 “They are just ahead here,” says Jesse Rubenstein, a fashion student studying abroad in Copenhagen, “There are so many local boutiques and designers that are completely original, inexpensive, and sell amazing, quality clothes,” she continues. Although walking down the huge pedestrian shopping mecca Strøget you will find H&M, Zara and other international chains, in the quieter and less crowded side streets you will see vintage stores, with classic designers and new ones, jewelry shops that sell avant-garde pieces and some local boutiques. 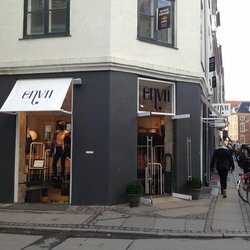 Envii, is another one of the many shops that is only found in Denmark. Most pieces are minimalist in neutral colors, yet made with high end fabrics and daring cuts. Each piece is a statement. “This was definitely my favorite shop. Besides the great selection of clothes, the prices are also very affordable,” says Rubenstein. Moss Copenhagen is a small chain that sells comfortable but lively pieces. 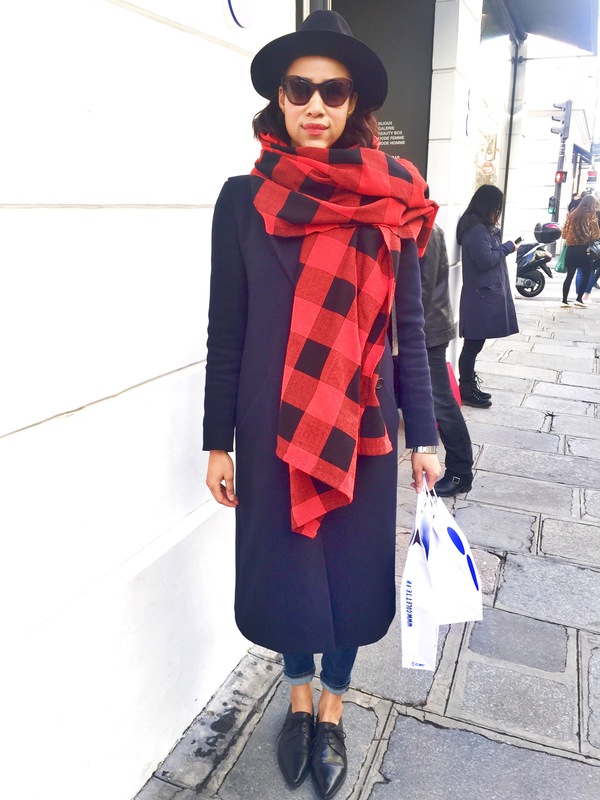 Their over-sized coats and comfortable sweaters allow for everyday sportswear while not losing an edge. 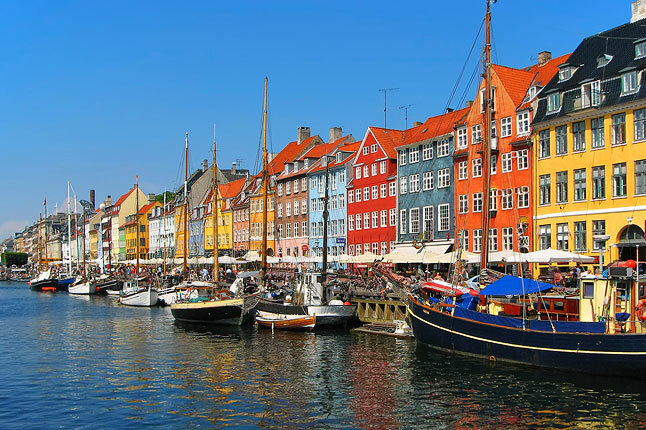 Between the pristine streets, divine cuisine, cutting edge fashion and timeless art, Copenhagen is proving to be not only the capital of Denmark but the capital of Europe’s youth culture. Luxury fashion house Louis Vuitton is no stranger to artistic collaborations, often featuring guest personalities to create limited edition renderings of their celebrated best selling products. Beyond high level collaborations with celebrated artists Takashi Murakami and Yayoi Kusama, Louis Vuitton has been in close contact with grafitti and street artists. 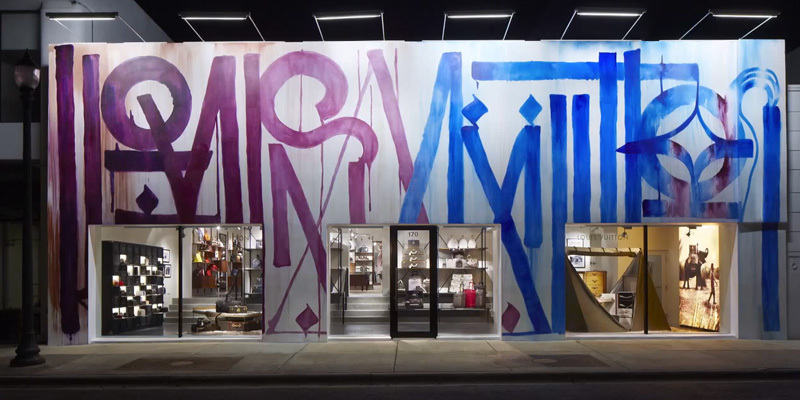 The first street art collection in 2001 for Louis Vuitton was with Marc Jacobs, the former brand creative director, and artist Stephen Sprouse. This collection was a quickly sold-out hit (seen above), and was recently feature at the Marc Jacobs/Louis Vuitton retrospective exhibit at Les Arts Decoratifs in Paris, France. Parisian street artist, André, has been a staple in Parisian street art and nightlife. He is the co-founder of club Le Baron in Paris, has also collaborated with Maison Kitsune in the past, and is the current Creative Director of L’Officiel Hommes magazine. His signature “Monsieur A” is the focus his surprise spray painted adventures, making pop-up mural appearances during his travels. In 2014 he produced a scarf depicting Mr. A for Louis Vuitton (above). 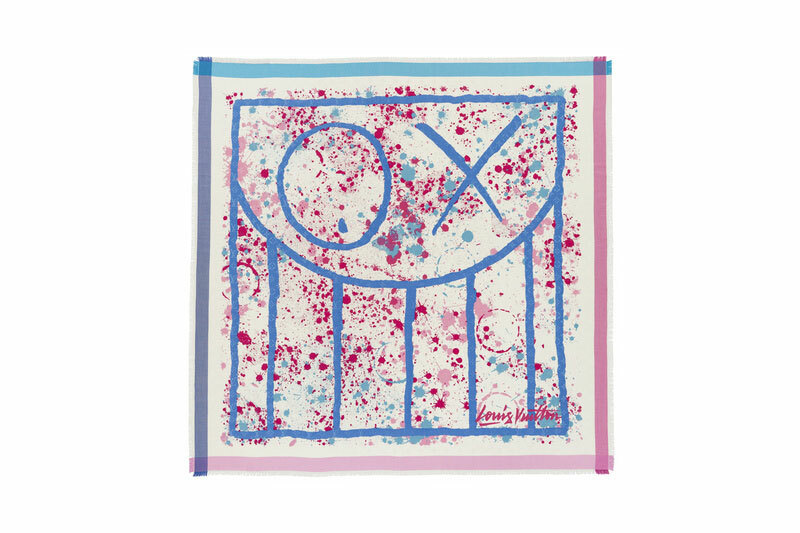 A brief collaboration but also a name and style to keep in mind, Marquis Lewis (known artistically as RETNA), designed a scarf for Louis Vuitton in 2013 (pictured above). His style is unique and full of color. Each symbol represents a part of his own self-created alphabet. Lanvin decided to spread its wings at the start of 2015. 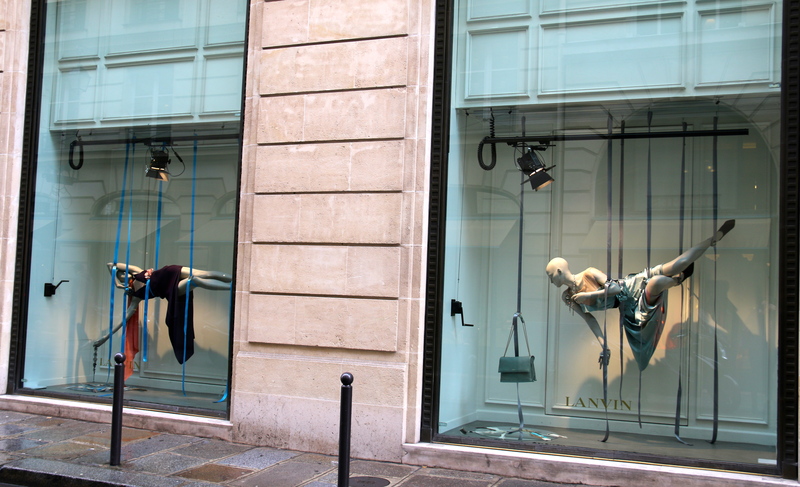 When strolling down on luxury lane Fauboug-Saint-Honoré, the window displays at Lanvin in Paris unquestionably stand out. Heads turn at the Lanvin bags that hang from colourful straps beside mannequins that depict fallen angels with majestic feathered wings. Whether it is the dynamism in these windows, the aesthetic juxtaposition of different textures or the opposition between heaven and earth – Alber Elbaz did a fantastic job! 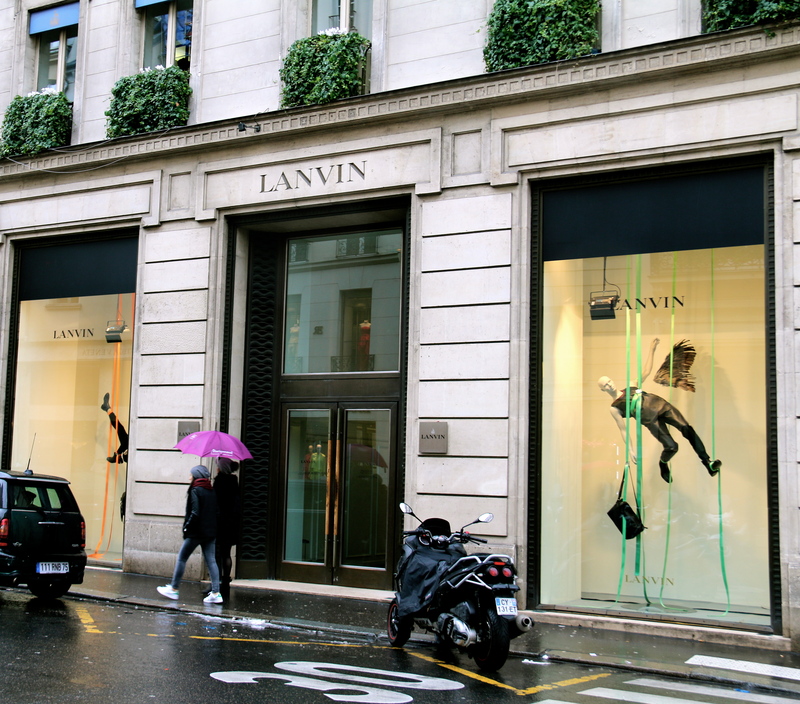 It goes without saying there is a subconscious connection between luxury and angels that Lanvin successfully incorporate in their 3D branding strategy. Falling back on the Greek mythology of Icarus, a story that warns of the dangers of hubris, Lanvin portrays their products in relation to some form of sacralisation. 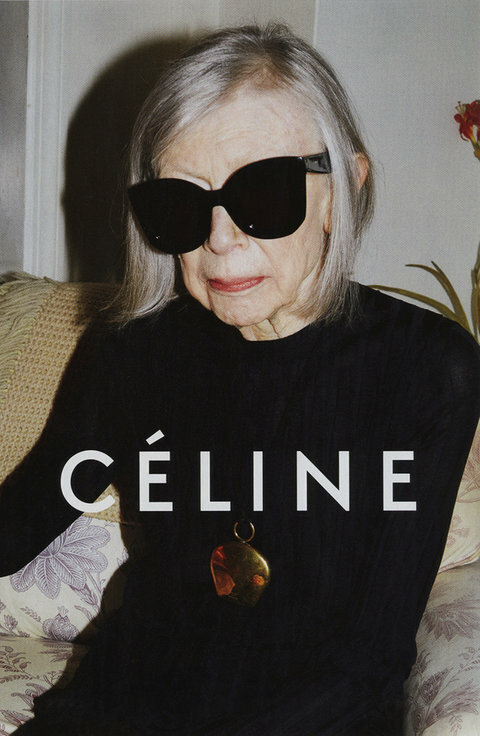 In other words, the French luxury brand plays with the idea of transcendence of the ordinary world to the divine. At first, it seems as though the Lanvin items are portrayed as sacred. However, the message could be exactly the opposite. The mythology of Icarus tells a story about a father crafting wings for his son Icarus to escape from Crete. He flew too close to the sun and the wax from the wings melted that ultimately let him fall to the sea. Working with the ‘Don’t bite into the apple, Eve’ tactic, the angels decided to leave heaven, because Lanvin products are simply irresistible. And so are their window displays! If the hair is longer, thinker, darker, and coarser she may be considered the sexiest woman on the planet. 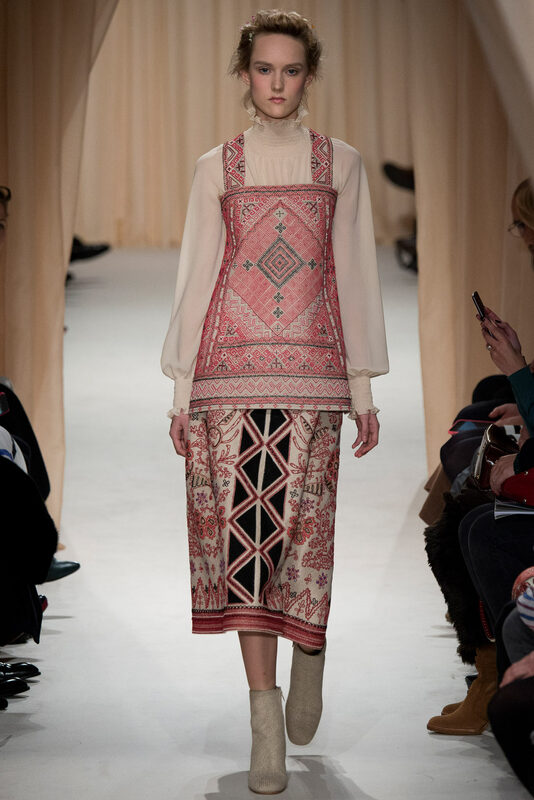 Frida Kalho’s uni-brows has now infiltrated the fashion world, but cleaned up. From Cara Delavigne’s brow whose embrace the cover of Garage Magazine to wild untamed arches of Sophia Vergara, these symmetrical hair clusters are the best accessories that can make or break an outfit on the streets or on the runaway. 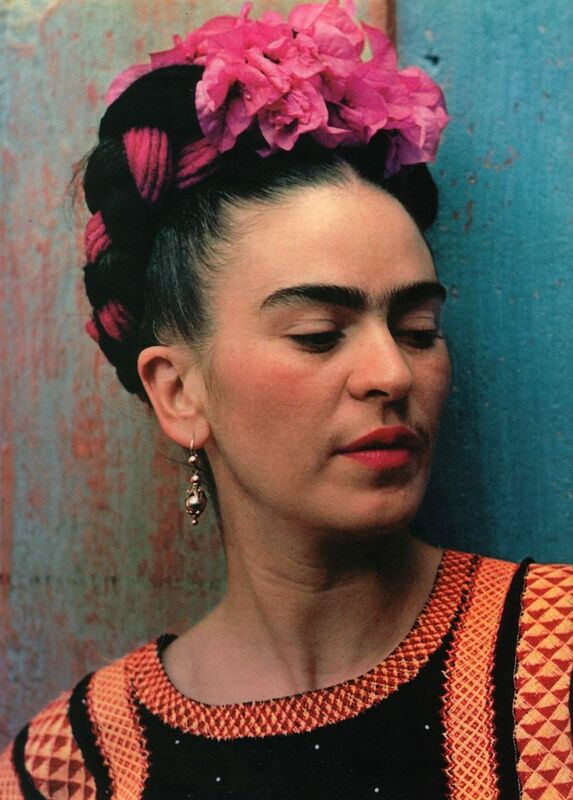 Never trust a woman with bad brows. Joey Healy, an architect for these bushes has the final word. 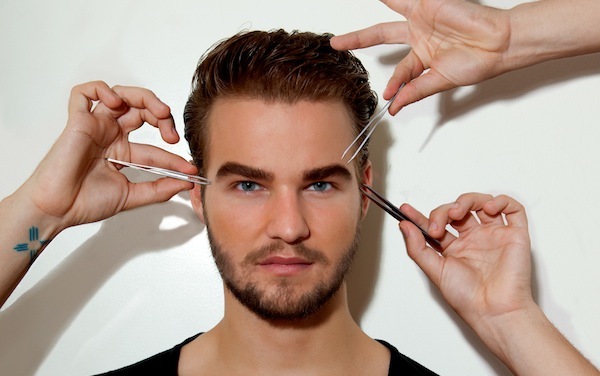 “This season, let natural well-groomed brows be your best accessory…Although thin, over-worked brows were once perceived as feminine, brows today are moving towards a more masculine look….” he advises OK! Magazine. Alexander Wang conveyed that ambiguous look for this Fall 2015 Ready-To-Wear with his all black collection on Valentine’s Day. 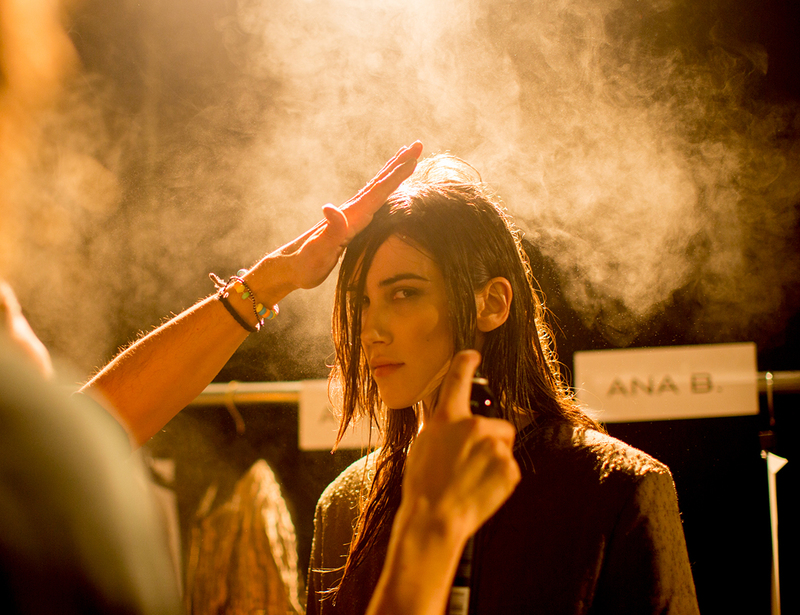 The brows of his models gave them the intense look that comes with the all black studded outfits. His vampire army of pale brunettes is the perfect template to not only shows off their dark arches but also compliments the beauty of the color black. If the fashion industry and the characters of Hollywood are going back to that Au Natural look then perhaps fashion is moving backwards. Natural dyes, organic clothing, caveman diets are trends that has been slowly creeping into society. Perhaps we should stop falling into traps of enhancing our beauty with tanning beds, cover-up, and waxing and let our bushes grow.